grough — Rain check: How's the forecast? Magazine / News / Rain check: How's the forecast? Rain check: How's the forecast? How's the weather in your neck of the woods? More to the point, how's the weather forecast? The Mountaineering Council of Scotland wants your views on the head-to-head between the two main mountain forecast services. For some time, the Mountain Weather Information Service (MWIS) was about the only comprehensive, reliable forecasting service for those venturing into the high ground of Britain. 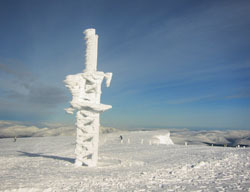 Then the Met Office, which previously had charged for its premium services, decided to ditch its outmoded fax-based reports and provide a useful service for hillwalkers and mountaineers with details of visibility, cloudbase, temperatures at mountain level and freezing levels – in other words, much of the information that was already on the MWIS website. grough sees this very much as a David and Goliath battle with the MoD, which runs the Met Office, finally having to concede it was being trumped by a largely amateur-run site that operates only part-time for some regions and was close to going to the wall not so long ago, but has become the first port-of-call for serious mountaineers and those leading groups on the tops. The bells-and-whistles Metcheck site is fine in principle, but grough feels it relies too much on computer modelling with very little interpretation by humans, with the result its forecasts can be spot on some days and wildly wide of the mark other days. MWIS still has some plus points: it provides synoptic charts which those with some meteorological knowledge can use to form their own views of the forecasts, and covers areas, such as the Peak District, that are ignored by the Met Office. On the other hand, it's good to see that the government-owned information provider has finally realised that there are thousands of people setting forth for the hills each day. Ultimately, the MCofS is after your views on the accuracy of the two sites. Check out their website and give them your views. If you haven't used the weather forecasting sites, your can find the Met Office one here, the MWIS address here and Metcheck here. Don't go out with checking them first.